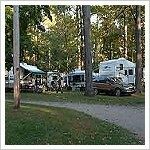 North Beach Campground is owned and operated by the City of Burlington, Vermont and located on the shores of Lake Champlain. We stayed here for a week last summer. We chose North Beach Campground because of it’s location and the fact that the area has a rather extensive bicycle trail system that allowed us to ped to the Burlington waterfront and the downtown area. (which is absolutely beautiful and alive with activity in the summer). The campground itself is nothing to write home about. There were only a few full-hook sites for big rigs. The property could use a little clean up… not that it was dirty, just that there were dumpsters, utilities and maintenance equipment stored throughout the campground when they could have easily been “strategically located” out of the general view of the campsites. It was nice to have the municipal beach within a few steps of our campsite, but on a busy summer day everybody in town shows up and they need to pass through the campgrounds to get to the beach, which makes for a lot of traffic. All in all, still not a bad stay, just not exactly what we were expecting. This is a lovely campground but with the levels of Lake Champlain being so high, is it open for the Memorial Holidays. Great place, great people, great fun.